The Event Planner module comes complete with a suite of several modules that can turn your DNN portal into a fully functioning event booking system. Event Planner Module - With RSS Feed - Displays events in a calendar, list, details and registations views. Event Planner Module - Events Map - Display events by location on a separate Google Map. Event Planner Module - Event Widget - Can be used to display events on any page of your portal. Event Planner Module - Search - Provide a consistent and convenient method to allow users to search for your event data quickly and easily. Event Planner Module - Attraction Widget - Can be used to display attractions on any page of your portal. Granted Evoq Preferred Product status by DNN. Turn any DNN portal into a fully functioning event booking system. Advanced SEO with faceted searching. Fully customizable layouts that support Razor scripts. Display events by location on a separate Google map module. Customers have their own "my booking section", allowing them to view all the events they have signed up for. Secure event management section, allows authorized users to fully administrate the modules bookings, events and settings. Create reports and plot graphs based on your booking statistics. Check out our road map to see what we have planned for future releases! Add responsive mega menu to the Event Planner admin. Add breadcrumb to the Event Planner admin. Create recurring events based on daily, weekly, monthly or yearly options. Display an unlimited number of events per day. Create events that span several days. Create partial day events by specifying the start and end time or full day events. Assign event to a DNN role, so only users in that role can view / sign up to the event. Optionally assign number of spaces available. Optionally assign cost to the event or leave as free. Allow admin to define the minimum number of attendees when a customer is placing a booking. Optionally assign maximum number of spaces a customer can book per transaction. Mark event as "active" or "inactive" - if inactive event will not be displayed in the calender, RSS feed and users will not be able to sign up to the event. Once user booking has a status of paid, optionally add user to DNN role and optionally define how long they should be in the role for. Support tiered pricing e.g. seperate price for children and adults. Charge a flat fee per booking for an event regardless of how many people attend e.g. this would allow renting out holday homes, equipment, etc. Discount band pricing, offer discounts based upon the number of places booked. Option to auto-remove an event from the calender when all spaces have been booked. Optionally assign a color to an event via a jQuery color picker, so when the event is displayed on the calender it uses that color. "Duplicate event button" when clicked will create an exact copy of the event this will make adding new events quicker. Import events via CSV file. Allow an unlimited number of images to be uploaded for an event and display in jQuery gallery. Assign an unlimited number of files to an event, so once a user has registered and paid for an event they will be able to securely download these files. "Share With A Friend" feature so users can optionally select an event and email the details to their friend along with a custom message. Allow admin to define an unlimited number of "related events", these events will be displayed on the "view details" modal popup window. Create and manage an unlimited number of tabs to display in the event details modal window. Event tabs have full HTML support. Enter text that should be included in the booking confirmation email if a given event is booked. Optionally specify a start and end date that you can register for the event, if you are outside this window registration is not available. Setting to auto-generate a Google site map with all your events, to ensure the best possible SEO. Canonical URL support, to improve SEO. Assign event to location and display event on a Google map. Templates output the event meta data so it conforms to http://schema.org/Event , thus allowing Google to better understand your event data. Allow custom event attributes to be created so admin can store their own unique fields against an event. Allow custom entities to be created so admin can create custom entities and assign which events belong to a particular entity e.g. an entity could be a "teacher" and values would be the "teacher names", this would allow an event to be assigned to one or many teachers. Enter a date / time when an event will be automatically published into the calendar. Daily: Every X days. Every weekday. Weekly: Recur every X weeks on the days you specify. Monthly: Recur every day of every X months. Recur every 1st, 2nd, 3rd, 4th or last day/weekday/day of every X months. Yearly: Recur yearly on the specific month and day you enter. Allow admin to manually define the dates an event will recur on. Allow admin to define dates that an event should not recur on this will allow you to exclude public holidays,etc. Optionally specify a DNN role that the user should be in to view the category. Assign events to multiple categories to allow filtering when viewing in calendar or list view. Display event categories in a jQuery mega menu or dropdown list. Separate list and details view. Output Google map highlighting the attraction location. Optionally allow users to sign up for events. Allow a user to add events to their wishlist so they can be stored for a later date. When registering optionally make the user to enter details of other attendees e.g. name, address, etc. and have booking email sent to them as well. "Quick Add" so admin can search for users and assign them to an event without the customer having to sign up themselves. Implement early bird pricing, so you can offer discounts the earlier the customer signs up to the event. Allow admin to define the fields the customer must complete when signing up for an event. e.g. address, telephone, etc. Auto-populates booking form with DNN profile information if user logged in. Optionally allow anonymous users to places bookings i.e. they dont need to register for an account on your portal. Setting to auto create a DNN user account for anonymous customers and assign the booking to that DNN account. User booking module so they can view bookings they have made. Admin booking module so they can view and adminisrate all bookings made. Allow admin to "cancel" bookings, user will be emailed if their booking is cancelled with an optional message from the admin. Cancelled places will then be able to be re-purchased. Export orders to .CSV file format. Optionally define DNN role(s) user must have in order to use offline payment method. Allow admin to define a surcharge for using one of the online payment methods. Optionally force SSL at checkout. If user is anonymous or country/region is not set in DNN profile, define default country/region on sign up form. Export a list of attendees to Excel format. Allow admin to define a color that when an event is fully booked the event will be displayed in when looking at the calendar view. Setting to define if we capture a company name, mobile phone and fax number when a user complets the sign up page. Specify at an event level additional email addresses who should be sent the booking confirmation email. Option to automatically email a reminder that the event is about to start to customers that have booked onto that event. Setting to enforce that the user agrees to the stores terms and conditions before being allowed to place a booking. Auto generate a pdf certificate and email it to users that attended an event, certificate will include event details, users name as well as editable header / footer text and image. 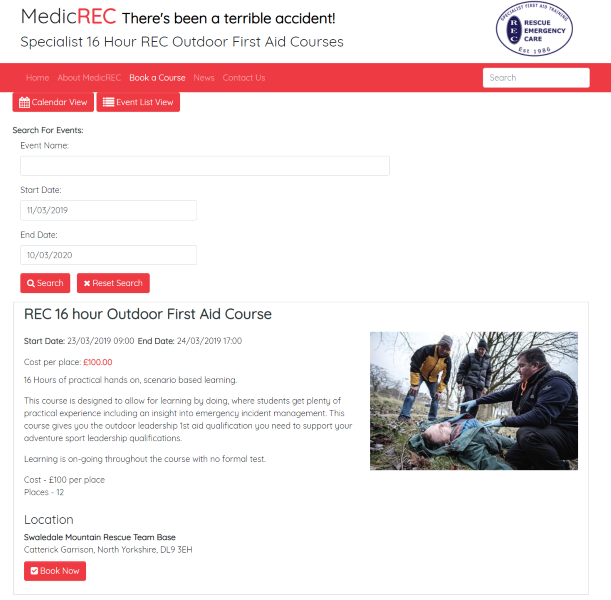 Add support so events can be listed within the module but the user is taken to 3rd party websites to complete the booking. Integration into SalesForce , automatically create the primary attendee or all attendees as "leads" in SalesForce. On an event by event basis optionally allow registration to happen on the event details page rather than the standard registration page. Allow admin to "check in" users that booked onto the event, so they can download a report to indicate who did / did not actually attend. Based on their answers alter the price of the booking. Specify the HTML control to be used to output the question and the possible answers: radiobutton, textbox, dropdown list or checkbox. Specifiy if the question is mandatory or if the user can skip it. Increase price based on their response. Specify if the question should be asked to all attendees, primary attendee or additional attendees. Allow event sign up questions to be assigned to all events rather than just single events. Heartland secure submit payments gateway. Payment Express PX Pay payment gateway. Free events e.g. payment not required to book. Once an event is fully booked optionally allow users to sign up to be waitlisted for this event. Admin can then contact waitlisted users if a space becomes available. Based on store location and customer billing address allow the module to calculate VAT or Tax on bookings. Assign products as Tax free. If based in USA choose to charge: Standard tax rate, No tax rate, Tax rate to home state only or Create tax tables so each state has individual tax rate. Optionally assign a bookings as tax free. Define VAT rates for: Zero rated bookings ,Reduced rate bookings & Standard rate bookings, then assign each booking a VAT rate. Admin or customer can download a PDF reciept of any booking that has been placed. Admin can define an image along with header and footer text to brand the PDF as per your needs. Enable / disable event reviews on a per event basis. Event average rating calculated from customer reviews. Event reviews approved by admin before appearing on site. Admin automatically emailed when a new review has been submitted. Enable/disable/ or delete event reviews. The following currencies are supported: USD, GBP, Euro, Australian dollar, Canadian dollar, Danish Krone, New Zealand dollar, Malaysian ringgit, Norwegian Krone (NOK), Indian Rupee, Eastern Caribbean dollar and Swiss franc. Automatically send customers reminders if they have not paid their booking X days before the event is due to start. Allow admin to define a "Event Management" and "Booking Management" DNN role, that would allow users in that role to management events or booking but not have access to the payment admin or core module settings. Create a role that allows users to add events however before their events are live on the system they will require moderation. Users in this role can access the admin section however they can only view / edit events they have created rather than events from the whole system. Create a settings so the user can define the format of the dates displayed within the module e.g. 1/12/2012 or 1st December 2012. Allow the admin to edit the details of a booking once it has been made e.g. billing address, customer email, etc. Define the timezone for the events so we can then output this in UI. Import and export your event data via XML file, allowing bulk updating / adding of events, categories, locations, attractions, etc as well as providing backup / restore functionality. Create reports and plot graphs based on your booking statistics, module will calculate booking totals and averages for the given time periods. Create graphs plotting the number of spaces available vs confirmed bookings for a given event. Optionally allow users to sign up and automatically recieve an email notification about an event. Let the user pick the date when they will recieve the email notification - time periods ranging from 5 minutes to 2 weeks! Allow admin to email all users who have registered for an event. Allow admin to email all users with a specific DNN role. Allow admin to create lists of users to email notifying them about events. Responsive layout based upon Twitter Bootstrap version 3.0, giving optimal browsing experience for mobile browsing. All our layout templates support Razor scripts, allowing you to write your own scripts to alter the layout of the module as per your needs. Switch between calendar or list view mode. Calendar supports month, week and day views. Allow admin to define default page view either "calander" or "list view". View events as a list - rather than just having a standard calender view, allow the user to view the events as a list. When user hovers mouse over an event a jQuery popup will appear showing a summary of the event. Main event details displayed in jQuery modal popup box or on their own DNN SEO optimized page with unique page title, meta description and keywords. Predictive searching - as users searchs for events the module will auto-suggest as they type. Allow user to sort events by event name, starting date and average rating. Create a hierarchical structure of locations that can be assigned to an event. Locations will have longitude / latitude so the events can then be plotted on a Google map module, allowing users to see events by location. An event can be assigned to multiple locations. Separate module that can be added to any page on your DNN site to display events. Built in template so we can display events in a jQuery carousel. Built in template so events can be displayed a mini-calendar. Create an unlimited amount of coupons that can be distributed to create a promotion or give specific users a discount. Define rules for each coupon. e.g. minimum subtotal, can be used multiple times, start date, end date, customer email address, etc. Offer a monetary or percentage discount. User enters coupon at point of checkout optionally verify the coupon has not been used before or that the coupon belongs to the customer attempting to use it. Support for creating 100% discount coupons. Optionally restrict a coupon to a specific event. Optionally restrict a coupon to events starting between a specified start and end date. Optionally limit a coupon to a specific email domains e.g. cartviper.com, nadevelopment.co.uk rather than just a specific email address. Optionally display an RSS 2.0 feed based on the events you have published. I've used this product ever since DNN 5. Great support, always being updated - and quick response to my questions. I highly recommend these guys. We built a complete class registration system with this module and were able to significantly customize it for our specific purposes. Great module! Very happy with it and we have had great experience with their support as well. Great module. Works perfect, without issues and does exactly what we wanted. This is simply one of the best DNN modules available. The other reviews don't do it justice. GREAT support. Quick response. The Responsive update is great. Thanks! Works great! Met all my needs. Not ideal for short events of 15 minutes (i.e screening clinics many time slots creation). Excellent module, runs well, easy to install and setup, I would recommend anytime. PLUS, great support from developper. Great module. Easy to implement and documentation was very good. Great module, great support from the developer. Very highly recommended. Easy to use, Simple and Quick. Immediate customer support response. GREAT PRODUCT. Great modules, worked as expected, our client loves it. Extreme Powerfull und fully configurable. Very good Customer Support. Great Module with Awesome Support.